With so many state-of-the-art products to choose from when remodeling a master bath's usable space, both the aesthetic appeal and desired function influence the client's choices. 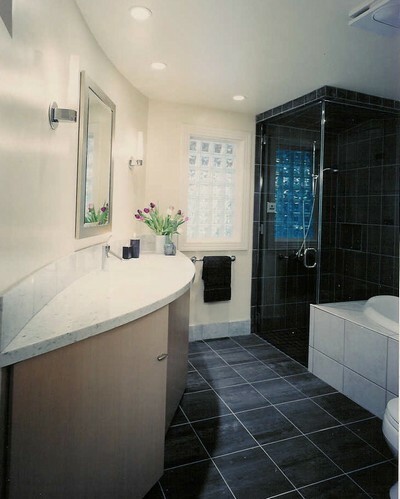 This Master Bathroom project was a part of a whole house remodel & adjoins the master bedroom (see Living Spaces) along the curved radius wall. 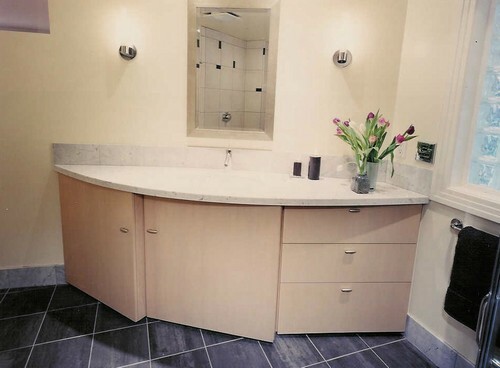 The bathroom features a custom vanity cabinet designed to fit beautifully along the radius wall topped with a marble counter; a bathtub set in a tile tub deck; a new glass block window; and a tile shower with a barrier-free enclosure.